Please take metro line 2 or 13 to Dongzhimen Station and get out from Exit H to the Dongzhimen Transit Hub. Take the first bus no. 916 at 06:00 and get off at Yangjiayuan Stop in Huairou District. Then charter a car to the fifth team of Xizhazi Village (Xizhazi Cun Wu Dui) and walk through the Xizhazi Tourism Ecological Garden. After hiking for about 2km (1mi) along country road, you will arrive at the Zhao's Hostel, the starting point of the uphill path up to the Great Wall. You will reach at Xidaqiang Wall after around 45 minutes' hiking. 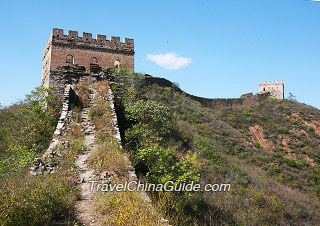 Follow the Great Wall rampart southwards for some time and climb up a nearly vertical stairway to the Beijing Knot, a strategic tower in the west section of Jiankou Great Wall, where you can see a tall withered pine tree on the top. It is the joining point of Great Wall sections from three directions. Besides the way you come, you can see other two ramparts stretching to the south and west respectively from Beijing Knot. Standing at the Beijing Knot, you can overlook the Eagle Flies Facing Upward to the south, who got this name because of the similar appearance to a flying eagle. A watchtower at a lower position looks like the head of the eagle and two sections of upward walls are its two wings. The Sky Stair is at the east wing of the eagle. Although only 80 meters (90 yards) in length, it is regarded as one of the most challenging section of Jiankou Great Wall because of a slope of 70 degrees. After that, continue this independent Beijing Knot Great Wall hiking tour along the wall for about 30 minutes to the General Guarding Pass. After another one hour's trekking, you will arrive at the lowest point of this section named Jiankou Spot. Get down from the ramparts there and walk along a trail northwards back to the Xizhazi Village. Charter a car to reach Huairou Bus Station in around one hour and take bus no. 916 there back to the downtown Beijing. 1. This Beijing Knot Great Wall hiking tour usually lasts for 7~8 hours for average backpackers. Make sure you get down from the wall before 17:30 to catch the last bus no. 916 which departs at 19:00. 2. The Jiankou Great Wall around Beijing Knot was constructed of stone bricks. After hundreds of years' exposure to the wind and rain, some sections have already collapsed into gravelly tracks revealing faint traces of the former stairs. It is highly suggested you wear skid-proof climbing boots and watch your step during the climbing. Even use both your hands and feet at some steep sections like the Eagles Flies Facing Upward and Sky Stair. 3. Do not set out this independent Beijing Knot hiking tour during rainy, snowy or thundery days. 4. Go along the path beside the Great Wall at some difficult sections. To do the walk from Mutianyu to Jiankou, is the Jiankou exit from the wall easy to find? Is there any signage? If it is not easy to find, is there another part of the wall that we can meet (and find) our car and driver? There is no English sign at Jiankou Great Wall. This part of the wall is very dangerous, you may follow other travelers to find the route. By the way, there is no guide and driver for this itinerary, you may explore it on your own. To hike from Mutianyu to Jiankou you don't need any signs to follow because it's simply the extension of the same wall. You hike till the western end of Mutianyu section and simply walk farther on the unreconstructed part of the Wall which is Jiankou. After 2-3 hours of hiking you can walk down the trail to the nearest village (either left or right side). To the right is Xi zha zi village, to the left you can walk down back to the entrance of Mutianyu section. For lodging in Xizhazi do you have phone#s for reservations? Hi, Xizhazi is just a small village with about 30 families and travelers who visit there can lodge in their home. Here I would like to recommend two families to you and you may try to contact them. One is Zhao Farmhouse and the phone number is 010-61611478, the other is Jiankou Villa and the phone number is 010-61611198. This information is only for your reference. How many kilometer is the hike from 9-Eyes Tower to Zhenbeilou Tower (and back to the village)? Can I hike it in one day? One day is not enough for you to hike from 9-Eyes Tower to Zhengbei Lou. It is very difficult and dangerous to climb the Jiankou Great Wall, so you are advised to make adequate preparations or find a local guide. Also, you'd better to join a group if possible instead of doing it alone. We walked in one day from Jiuyanlou (nine eyes tower) to the restored section of Mutianyu via Beijing knot and Jiankou. This is NOT a good idea. My girlfriend was very slow on the descending slopes and it took us 17 hours walk including a few breaks (departure at 5am from Jiuyanlou after sleeping in the watchtower, arrival at the first restored tower of Mutianyu at 10pm where we slept again on the wall). I would like to trek from the Jiankou 9 Eye Tower to the Toboggan at Mutianyu in 1 day sun up to sun down(roughly 12 hours +/-)... is this possible?! I'm an active athlete in exelent shape and I figure by my research online of how long each section is it shouldn't be a problem. I'm just looking for confimation from someone that has done it or a similar trek. Thanks! I am afraid that one day is not enough for you to trek from Jiankou 9 Eye Tower to Mutianyu Great Wall. Also, I do not think it is a good idea to trek from Jiankou to Mutianyu, because it is very dangerous. Hey JoeW - have you done this trek? I'm planning the same thing together with some olg college buddies. We're all in good shape as well. I've been to the Xizhazi village and explored the wall there as well. Seems not as dangerous as a lot of people make it seem....I think it is possible, however even after research I have not found confirmation of anyone ever having done it. Much appreciated, thanks! Yes, JoeS I've done the hike from Jiankou to Mutianyu to beggan from about 5am to 11pm - this was about 4 summers ago so not sure how the condition of Jiankou is now, but when we did it, it was not terribly challenging. I dit it in 2007 in about 18 hours (5:00 - 22:00 + 1 hour the next day) but we were very slow as my girlfriend was afraid in descending slopes. If you are in excellent condition, you will take much much less time than what we did. It's not an easy trail though: quite dangerous at several places. Scroll down to see the Great Wall photos. I did half on 1 day, trekked back to the village for the night then the other half the next day... was amazing! Thanks for the reply... happy travels! Scroll down to Wall photos. Safe travels! 1. You can take Bus 810 to the north gate of the Forbbiden City. If you want to the front gate, you should make a transfer at Tian'anmen Square West or East. Not far away from the Tian'anmen Square. 2. Get to Beijing North Railway Station first and take the train to Badaling. Take 810 at the hotel to Xisanqiao or Qinghe, then change to Bus no. 919 to Badaing Great Wall. 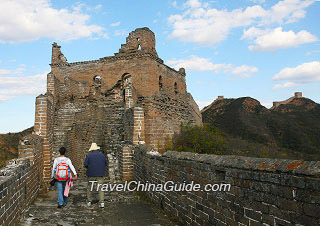 FYI: Badaling Great Wall Transportation(https://www.travelchinaguide.com/cityguides/beijing/greatwall.htm) . 3. Walk to Yong'anLi or Guomao Subway Stations near the hotel and take Beijing subway(https://www.travelchinaguide.com/cityguides/beijing/transportation/subway.htm) Line 1 to Tian'anmen East. By Bus: get to Dabeiyao West Bus station to catch 4, 1, 802, 37 to the square. 4. Take Bus 1, 4 to Gongzhufen East and change to 394 at Gongzhufen North to Summer Palace. Or take 810 to Tieshizifen then change to 331 to the destination. 5. Take subway Line 1 to Dongdan and change to Subway Line 5 to the East gate of Temple of Heaven.